The Politics of Justice: From a human rights revolution to global justice? is the theme of the 9th annual conference of the Hague Academic Coalition, to be held October 12 and 13, 2012, at the International Institute of Social Studies, Kortenaerkade 12, The Hague, Netherlands. Delivering the keynote address will be Professor Martti Koskenniemi of the University of Helsinki, Finland. 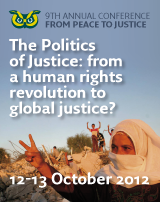 Other speakers will include Sarah Nouwen, University of Cambridge; Aisling O’Sullivan, Irish Centre for Human Rights, National University of Ireland-Galway; Rianne Letschert of the Netherlands' Tilburg University; Sharon Weill, University of Geneva, Switzerland; Natalie Rosen, Hebrew University, Jerusalem; Maja Groff, Hague Conference on Private International Law; Abiola Makinwa, Hague University of Applied Sciences; Eefje de Volder, Tilburg University; Barbara Oomen, Utrecht University / Roosevelt Academy, Netherlands; and Claudia Saba, University College Dublin, Ireland. Full program here; conference details here.